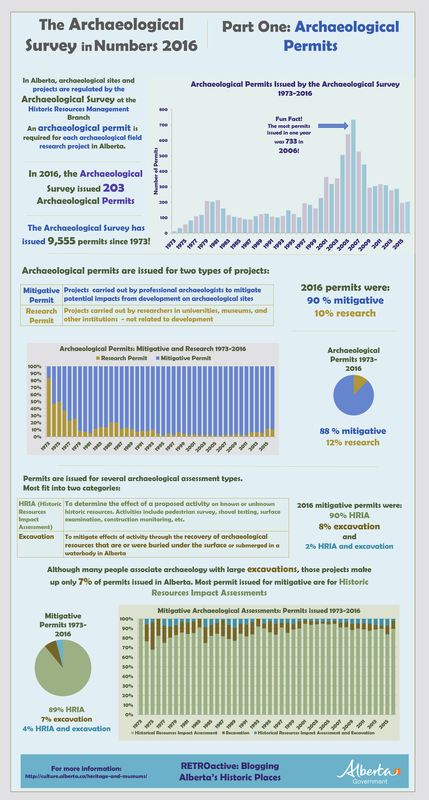 Today’s blog post is the first of a series of infographics exploring archaeological research permits and archaeological sites recorded in 2016 and all the way back to 1973 at the Archaeological Survey. Happy New Year to everyone! We are excited for the New Year and look forward to sharing more of Alberta’s history with our readers. As many of you know, 2017 marks Canada’s 150th anniversary. We hope to touch on this theme throughout the year and highlight the role that Alberta has played in the country’s history. Another goal we have for this year is to connect with our readers more. We want to know what you would like to learn about! So, we are launching a new initiative called Ask an Expert. The Historic Resources Management Branch of Alberta Culture and Tourism is responsible for the identification and conservation of historic resources in Alberta. Historic Resources include historic places and structures, archaeological sites and artifacts, and traditional use sites. We also deal with geographic place names in the province. Do you have a question about any of the following topics (related to Alberta)? If so, we’d love to hear from you! You can submit your question by commenting on any one of our blog posts (preferably related to the topic), or you can leave a comment on our Facebook page or tweet at us on Twitter. When we receive questions we will track down our resident experts to answer them for you. The answers will be in the form of blog posts or videos. Cheers to 2017! We look forward to your questions.